Winter snow falls in front of the main entrance to the Prince George's County courthouse at Upper Marlboro in January 2009. 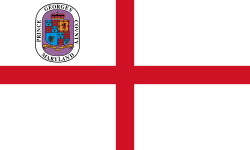 Prince George's County (short PG County) is a county in the U.S. state of Maryland. It borders the eastern part of Washington, D.C. As of the 2010 census, 863,420 people lived there. That was the second-highest population of any county in Maryland, behind only Montgomery County. The county seat is Upper Marlboro. ↑ "State & County QuickFacts". United States Census Bureau. Archived from the original on July 3, 2001. Retrieved August 24, 2013. This page was last changed on 1 April 2018, at 00:26.